Wesley Snipes has earned his way into the hearts of action genre fans with the Blade movies, Passenger 57, Drop Zone, and others. However it's been a while since he's had a major film all to himself, which is why his fans have something to get excited about with The Recall, a sci-fi flick that promises a groundbreaking cinematic experience. The first trailer has arrived and in the beginning it looks like just another Cabin in the Woods scenario as a bunch of teens get away for a wilderness weekend, only for the Earth to be invaded by aliens. 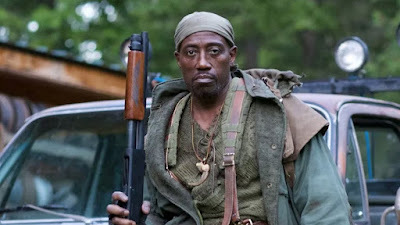 Snipes plays the mysterious hunter/survivalist who saves them, claiming the attack had been prophesied for years. Veteran filmmaker Mauro Borelli, who has worked on Pirates of the Caribbean and Captain America films in different capacities, is behind this one, and it was developed specifically for Barco Escape theaters. Those are the special three-screen panoramic theaters hoping to offer a unique moviegoing experience to audiences all around the country. There is also a VR short film that helps to set up the world of The Recall. Also starring RJ Mitte, Hannah Rose May, Jedidah Goodacre, Laura Bilgeri, and Niko Pepaj, The Recall opens in Barco Escape theaters on June 2nd, with a theatrical and VOD run beginning June 16th.